Congratulations to Fat Fish Games, developer of our February GameSalad Game of the Month, Tiny Goalie. Our February winner is a simple-but-addictive game whose adorable netminder will steal your heart. We sat down for some virtual tea and biscuits with Anthony Barker, Fat Fish’s Creative Director. 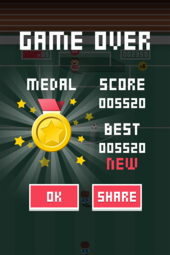 GameSalad: Congratulations on Tiny Goalie! We understand the game went to #1 Sports Game in Italy, which is amazing! Has the game met or exceeded your expectations? Anthony: I wasn’t expecting the amount of uptake Tiny Goalie received in Italy. It is great to see your hard work embraced that much anywhere in the world, however I was expecting the UK, of all places, to achieve that goal first. Russia soon followed and Tiny Goalie is currently doing well in China now too, however it is still yet to crack the all important UK and USA markets. My fingers are crossed that we’ll get a second-wind when the World Cup swings around. Over the last few years I’d been increasingly interested in game design and the overall process of making games – that may sound a bit weird seeing as I work in the games industry – but on a day-to-day basis, I only deal with one aspect (and from one viewpoint) of a very large and complicated endeavour of which I only had a partial knowledge of. Game design became a little bit of a hobby over time, and after a few failed paper design projects, I thought one of the best ways to really learn was to get stuck in, boots ’n all, and start making a game myself. GS: Tell us a little about FatFish and yourself. How long have you been developing games? Are you a solo shop, or a team? What’s your ultimate goal for the studio? Anthony: I am a Creative Director at Fat Fish Games. A small indie game studio located just outside Brighton in the South East of the UK. We’ve been developing games full time for a few years now, however before this we did some ‘work for hire’ games for a range of clients including some UK Premiership Football (soccer) clubs, movie tie-ins and other brand-based games. Our goal at Fat Fish Games is to create fun, social and engaging games for a casual audience. Games that are easy to pick-up-and-play, challenging to master and have the ability to compete with other gamers around the world. We have released a few titles in the past, however our current focus is on our two flagship titles – Bubble Shot and Word Cubes along with looking ahead to some new projects. GS: What brought you to GameSalad? Was Tiny Goalie your first GS game? How did GameSalad help you make Tiny Goalie? Anthony: I picked up on GameSalad around two years ago and have been playing around with the engine ever since. GameSalad is a fantastic tool for people, like me (without programming knowledge) to pull a concept together in such a short space of time. Describing a game mechanic or concept can be hard sometimes, so it is really helpful to use GameSalad to prototype something interactive to my colleagues. My first release was a take on the Fruit Ninja mechanic called Meat Ninja. I worked off a few available GameSalad templates at first, which is always a great way to learn the ropes of a game engine, but by the time I had released it on the App Store I had rebuild the whole gameplay mechanic from scratch to create the game to exactly how I wanted it. After a few other unreleased concepts, Tiny Goalie was my next release. It was a solo development, created entirely by myself. It is a simple concept, that was first created purely to test new game mechanics for one of our other games – Soccer Headers. Soccer Headers was a 3D-based game, however being just an artist with limited coding skills I had to recreate the game in its most simplest form – 2D, using GameSalad. After showing the game to a few friends and family it was clear that this game alone was simple, yet fun and addictive. Putting in Game Center had players of the game comparing and bragging about their scores, and it was this that showed all the signs that Tiny Goalie needed to be released. So with a few extra days of extra polish I released the game onto the App Store on Google Play Marketplace. GS: Let’s talk about “Flappy Bird”. A case could be made that the retro style and simple gameplay of Tiny Goalie takes some cues from “Flappy Bird”. Was that intentional, or just a happy accident? Anthony: Flappy Bird success, and all the clones that have followed, has baffled me. These days you can’t predict what chart success the App Store will bring from one week to the next. Tiny Goalie was developed long before Flappy Bird saw the limelight, however since seeing this simple, retro craze it helped myself and our team at Fat Fish Games to decide to release Tiny Goalie. 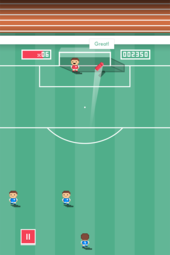 Tiny Goalie’s simple game mechanic and interface is probably why reviewers and onlookers easily compare the game to Flappy Bird. Even some tweets and reviewers have said this is the next follow up to Flappy Bird – I can only wish for the same attention and user base that Flappy Bird has received! GS: About how long did it take you to develop Tiny Goalie? Any unexpected development snags or tips you want to share? Anthony: The majority of Tiny Goalie was developed over a few weekday evenings and weekends. So in total I’d say around two weeks in chess clock time. I think creating the art and fine-tuning the gameplay took longer than getting the game setup. Since creating Meat Ninja I wanted to make sure that the game worked well across multiple screen sizes and devices, all under one single build, so that took some time to get my head around. Rather than doing lots of screen size checking and camera morphing I just created an iPad version and made sure any gameplay would occur in the smallest cropped regions, which on iOS is the iPhone 4”. I find this to be the most easy way to develop a universal build. I’ve tried many other methods as soon as GameSalad supported universal builds, but they all seem to over complicate things, even more so when you start to support the many Android screen sizes too! GS: What’s next for FatFish games? Anthony: Our next game ‘Tiny Touchdown’ releases this week (http://onelink.to/7cggmh). Hot off the heels of Tiny Goalie I felt that the American fans deserve to have their beloved sport also have some Tiny flavour, so I created Tiny Touchdown. A fun and frantic American football-based game, also created in GameSalad. Fat Fish Games will continuing to develop our other games – Bubble Shot and Word Cubes – making them better and better, whilst also looking ahead to a number of new titles that we hope to release later this year. So you can follow me @biglime, or @fatfishgames on Twitter, or visit our website www.fatfishgames.com and Facebook page fb.com/fatfishgames for all the latest news on our current and upcoming games. Thanks, Anthony! Congratulations on your success and good luck with Tiny Touchdown and your other games! Tiny Goalie is FREE and available now for iOS on iTunes App Store and Google Play for Android devices!